The prize is shared with Douglass C. North for having renewed research in economic history by applying economic theory and quantitative methods in order to explain economic and institutional change. Fogel, Charles R. Walgreen Distinguished Service Professor of American Institutions, was a Nobel laureate in economics. He has been recognized worldwide as an economic historian and scientist. 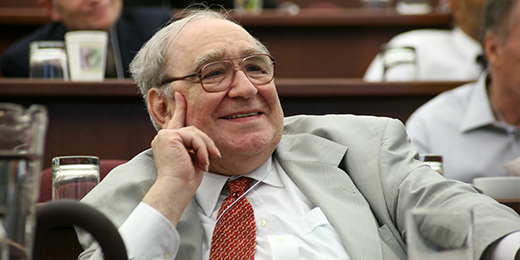 Until his death in 2013, Fogel led the Center for Population Economics at Chicago Booth. Fogel was a leading advocate of the use of quantitative methods in history. His research interests included socioeconomic and biomedical predictors at early ages of morbidity, mortality, and labor force participation at mid-adult and late ages, forecasting pension and health care costs, and strategic marketing forecasting. Fogel taught at Chicago Booth from 1964 to 1975, and returned in 1981 after work at Harvard University.